This is the February 2018 edition of the Tech:NYC newsletter. If you're not already getting this in your inbox, sign up now. A quick heads up that we are experimenting with the format of the Tech:NYC newsletter, including the addition of occasional notes from our Executive Director Julie Samuels. We look forward to sharing more with you. Last week, the fight for real and meaningful net neutrality kicked into high gear when the FCC’s proposed new rule was entered into the Federal Register. Without further action, this step is the last before it becomes the law of the land. The fight is not over, though it now moves to different fronts—Congress and the courts, primarily—where it’s being led by two New Yorkers, Sen. Chuck Schumer in the Senate and Attorney General Eric Schneiderman in the courts. In fact, New Yorkers have always led the fight for net neutrality. It started years ago when New York companies like Etsy, Kickstarter, Tumblr, Foursquare, and Meetup led the charge in D.C., taking the Amtrak down countless times to meeting with policymakers and making the case that innovation required the kind of free and open internet that only real net neutrality can protect. And they’ve kept up that fight. The good news is that their elected officials have heard them. Sen. Schumer, AG Schneiderman, Gov. Cuomo, and Mayor de Blasio have all taken up the call, using the tools at their disposal to keep the fight for net neutrality alive. You can join those important efforts here, ahead of tomorrow’s day of action. None of this is surprising. New York is home to a robust, inclusive, and growing tech community, one that embraces civic engagement. In fact, just this morning Crain’s New York published an in-depth profile on the rise of NYC tech ecosystem, which is well worth your time to read. I consider myself lucky to be part of this community. Thanks for all you do. And keep at it—we’ve still got a way to go. We just launched a new page about the NYC tech ecosystem that provides a snapshot of where the NYC tech industry is now, including sections dedicated to startups, jobs, funding, diversity, and exits. 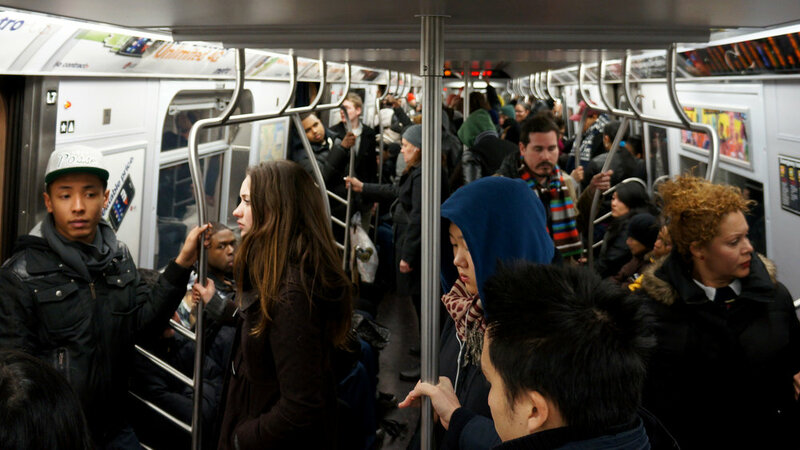 In a new op-ed, Tech:NYC Executive Director Julie Samuels writes in City & State that New York’s continued transit crisis threatens our economic future and that our elected officials must use every idea at our disposal to solve it soon. New York is one of the hardest states for registering to vote. Tech:NYC publicly voiced support for Governor Cuomo’s new automatic voter registration plan, which will make voting more accessible for many New Yorkers. Crain’s New York just published an in-depth profile on the rise of NYC tech ecosystem, prominently featuring our members Warby Parker and Zola. NYC-based Flatiron Health was acquired by Roche for $1.9 billion, a huge win for the New York tech scene. Mayor Bill de Blasio gave his annual State of the State address where he shared new ideas for improving NYC’s democracy. The National Venture Capital Association led a coalition of 31 business leaders and organizations dedicated to entrepreneurship, including Tech:NYC, in calling on the Trump administration to not rescind the International Entrepreneur Rule. NYC’s new DoITT Commissioner and CIO Samir Saini gave his first public speech Thursday, in which he said he wants to bring human-centered design to apps and websites created and provided by the city. Three female-owned VC firms that are helping close the gender gap—BBG Ventures, Female Founders Fund, and Forerunner Ventures—made Crain’s New York’s list of most active VC firms. Business Insider published a deep dive into Cornell Tech and its Studio Program that helps students build a company from conception to prototype. March 3-10: NYC’s annual Open Data Week is a chance to attend events where you can learn about free NYC data and all of its uses. Check out all ODW events here. March 8: Our member Fusemachines is starting a new monthly meetup called Democratize AI to start meaningful conversations and break barriers around artificial intelligence. The meetup will be held on the second Thursday of each month at Work-Bench. Sign up for the first event here. March 24: Alleycon, a one-day tech conference backed by Columbia Business School and sponsored by Microsoft, will feature TED-style talks by rising entrepreneurs, VCs, and founders. Speakers include Casper CEO Philip Krim, First Round Capital Partner Hayley Barna, and Venmo Co-Founder Iqram Magdon-Ismail. Use the code “TECHNYC” for 15% off. Register here. Say hello to our newest members! ActionIQ: The leading enterprise customer data platform, solving the biggest problem marketers face: the flow and scale of data, analytics, and campaigns. BlockFi: A secured non-bank lender that offers USD loans to crypto asset owners. Ense: A new platform for you to speak, sing, and shout to the world. Fusemachines: An AI solutions and services provider that offers AI engineers to companies seeking to develop capabilities in big data and machine learning. Macroscape: Empowering entrepreneurs to launch on the blockchain. MVP In a Box: Maximum valued product construction service. Oppida: Tailored IT security services for industries including banking, insurance, finance, and more. Pico: Revenue and lead generation tools for the modern publisher. Radar: Radar helps you build better mobile apps and make better decisions with location data. Shindig: Large-scale video chat events providing the ultimate level of interaction between presenter and audience. SoulCycle: A New York City-based fitness company with more than 80 locations across the U.S.
Teampay: Purchasing software built for modern, technology-enabled businesses. The Culinistas: Facilitates and enhances private chef services. If your company wants to play a more active role in the NYC tech community, now’s the time to join Tech:NYC. Check out our membership page, and let us know if you have any questions.